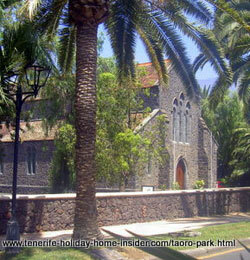 The Taoro Park one of best suburbs for a holiday home in Tenerife. 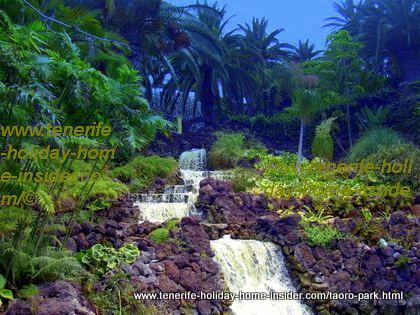 The Taoro Park better known as Parque Taoro with its more than 100 000 square meters is the biggest of Puerto de la Cruz and includes the 'Mal Pais'. Its superb views, often gigantic shade trees and some soft, sandy pathways of La Sortija of former horse races are a jogger's and dog walker's paradise. 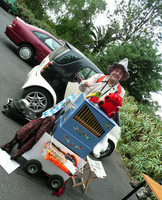 It even has a free fountain for the sportsmen and the four legged visitors. Paved pedestrian walks which are good for wheel chairs run along the main avenue the Carretera Taoro. Taoro Parque Mirador of Jardines Atalaya gardens. 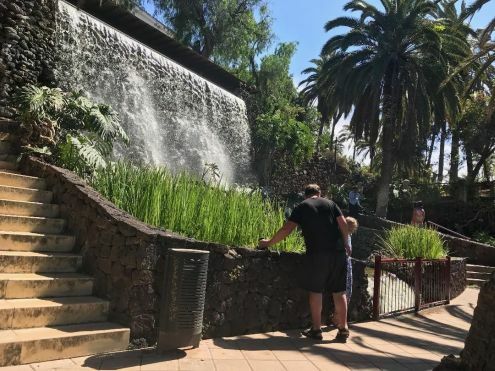 This Taoro Parque of the Atalaya Gardens with its spectacular look-out also has one of most beautiful free Tenerife water parks, besides the Risco Belo Aquapark part of which costs entrance. The air all over this suburb with its large landscaped public gardens is unspoiled. Smell pink, red and white Oleander, yellow Frangipani from Hawai, Bougainvillea, Hibiscus and also birds of paradise plants by its way sides. Once a year, huge Brazilian Jacarandas create a park ceiling of a gigantic show of purple blooms overhead. 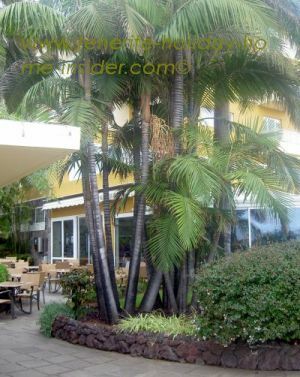 Whoever has a private holiday home in Tenerife and, has chosen it in this area of Puerto de la Cruz is fortunate, indeed. German investors also showed great faith into this suburb. They bought the four Star Hotel Chiripa to open it by 2019 as the second five star hotel of Puerto de la Cruz after Hotel Botanico. Almost a tropical oasis below Hotel Taoro. Admire the lush vegetation by the Cascadas de Taoro which look like natural waterfalls. Natural waterfalls Acantilados del Taoro, almost by the Jardines Atalaya. 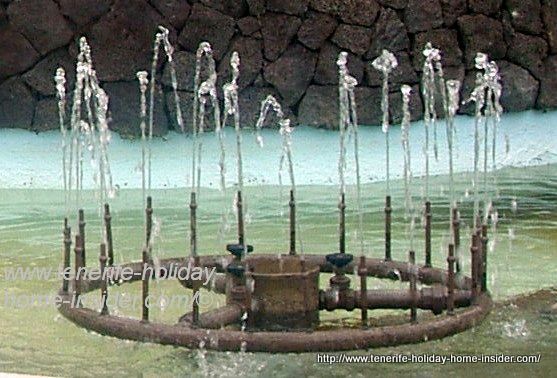 There are no free public water parks on the biggest of all Canary Islands which are better. Even its surrounding copies the nature of a rain forest, unlike the man made waterfall by beach Playa Jardin. The part of the Taoro is a photographer's dream with its varied spots and different lookouts. Taoro hotel with show garden and open air plant museum. Hotel Tigaiga of 4 stars opposite the Taoro Sortija park near Alberto Bar Puerto de la Cruz. 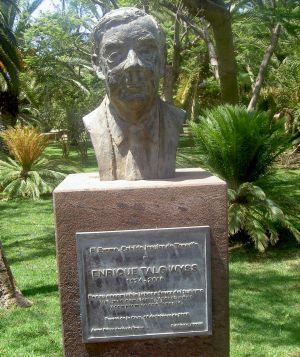 Enrique Talg Wyss founder of Hotel Tigaiga and celebrity of Parque Taoro for tourism achievements and environmental care. Hotel Tigaiga of Taoro Park which is highly popular with German tourists has park like gardens and a museum section. There plants, shrubs and trees are categorized. Hotel guests may get a free guided tour. This hotel is also worth a visit for a €3 folk dance concert on Sundays at 11a.m. 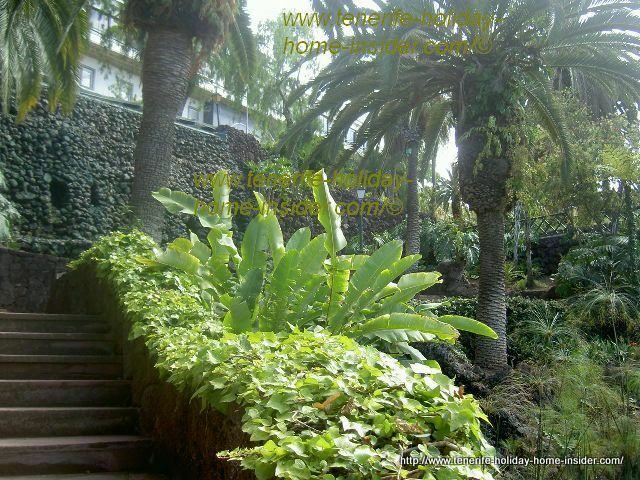 Hotel Tigaiga was one of most popular hotels of all Canary Islands, as per TUI surveys and statistics, a short while ago. 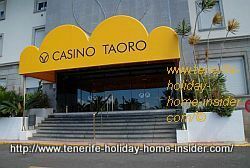 Hotel Taoro becomes Casino Taoro and is moved twice. The old Casino Taoro which replaced the Hotel Taoro. Glimpse the Hotel Taoro through the plants above the waterfall park... That's where I last saw the entrance sign Casino Taoro at the end of August 2007. This center of gambling had been above and under ground in the Lido or Lago Martianez for more than seven years. In 2014, the Casino sign at Hotel Taoro disappeared. Now, the casino has shrunk much and is a neighbor of Ermita San Telmo outside and beside Lago Martianez. 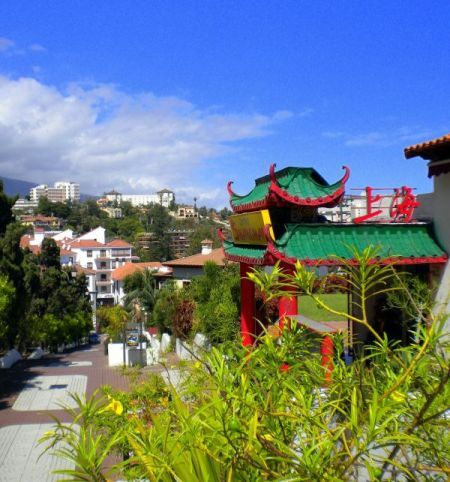 1893 was the year when this grand hotel which was one of most historic tourist mansions of Tenerife opened its doors as the first "Spa" resort in Spain. It was designed by the free mason Adolph Coquet. A famous Londoner and Dr.Victor Perez from Tenerife both medical practitioners praised it for health tourism. The renown British Yeoward brothers supplied the vessels which didn't only serve a lucrative fruit and vegetables trade but brought in ship loads of tourists. This hotel the biggest of Spain at the time entertained Tsar Peter of Russia and the European Elite more than once. King Alfonso XVIII spent a short period there in 1906 when so much happened on the biggest Canary Island. This hotel whose peculiar turrets are still intact wasn't only a symbol of culture of its town with horse races, carnival and other events. 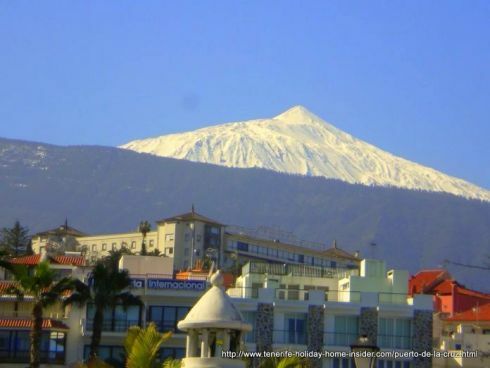 It was an icon and a show peace for Tenerife as well as for Spain until about 1975 when tourism demanded modern resorts. The building you see today which is towering about 100m above town is a replica. It was never as good as its original after everything was destroyed by fire. Only its stunning views have hardly changed. It was remodeled to be Casino Taoro in 1976. Its gambling started in 1979 until it closed its doors in 2007. Congress Center Taoro of Puerto de la Cruz. 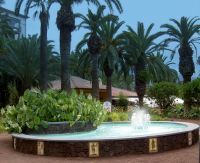 The Congress Center of Puerto de la Cruz is within the hotel gardens by the pond. The demand for it had outgrown its size at some stage. Suddenly, it was closed but, a beautiful Christmas concert which took place there made the news in 2008. However now, all is cordoned off again. 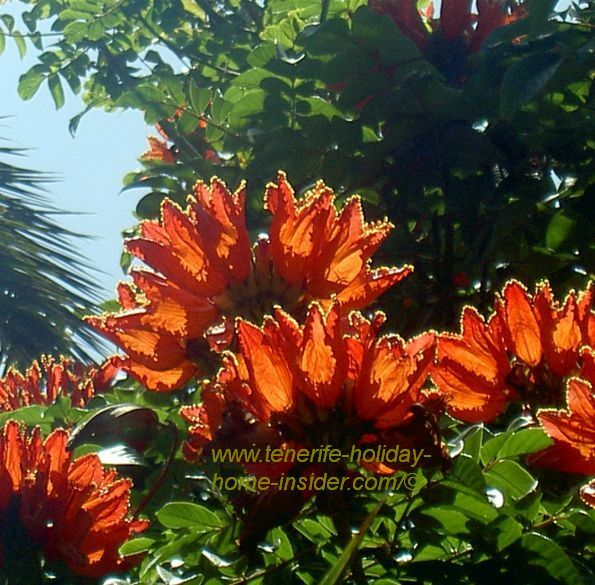 The Recinto Ferial in the Tenerife capital will tell you more at Tel: 0034 + 922 23 84 00. 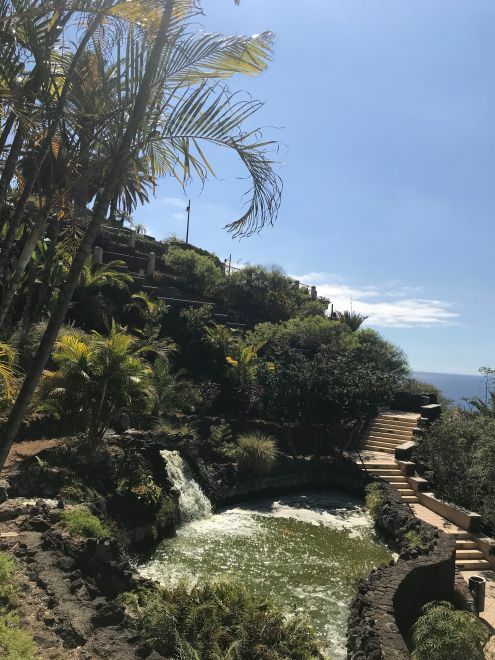 A friend of mine attended a Tenerife medical congress in a very large seminar hotel called Semiramis in La Paz which is only separated from the Park Taoro by a gorge. The Spa hotel Botanico is by far the more luxury alternative. Both hotels can be seen from the upper rooms of Taoro hotel. Mal Pais would translate into bad land. However, parts of it where water was nearby were always fertile. Also there, encounter ancient lime stone kilns which date back 100 years. 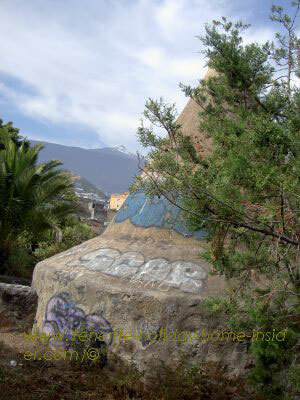 Imagine the lime used as Plaster of Paris for much art Nouveau, above all in the Tenerife capital. Marvel at one such limestone production kiln. This is one of 3 manufacturing domes at Las Capezas on the bottom of the sloping terrain of Malpais. Graffiti has become the order of the day, unfortunately. Vegetables are still grown near the little lime stone manufacturing park, which is good. Other buildings which supported production are gone, by the way. Panoramic views of Taoro Park. Alberto's bar view from its veranda reveals breath taking Puerto Cruz sunsets as far as San Juan de la Rambla in the West. On clear days, the light house behind Los Silos can be seen. Unfortunately, none of the charming old Canary houses can be made out from there. View of Puerto de la Cruz from the Mirador below the Taoro Hotel. 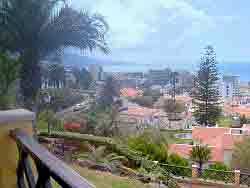 The view from the Mirador Maria Loynaz spreads over luxury villas of Taoro Park and parts of downtown Puerto de la Cruz to the ocean. 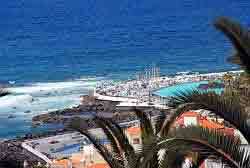 Great Tenerife panorama photo shots may be taken. 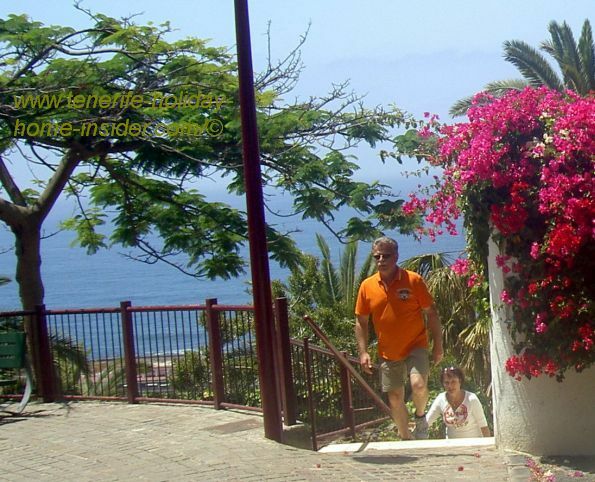 Carretera Taoro by the former Casino where flowering trees and Bougainvilleas grow by ocean views. Parque Taoro La Sortija of horse races with most wonderful, natural looking landscaping and gigantic trees. Agatha Christie and Hemingway were also visitors of this Taoro oasis besides the poet Dona Maria Loynaz, information of whom find at loynazenglish.org a web which may be safe to look at but not to connect to, as yet. There, just below the former Taoro Casino, linger like the poet under palms besides fountains amid many yellow Lilies and, blue Agapanthus flowers. Listen to the birds in large trees and to the splashing waterfalls next to it. Walk a few paces and spot the almost tropical Restaurante Taoro behind the Cuban poet's fountain. It's now called Terraza Taoro. 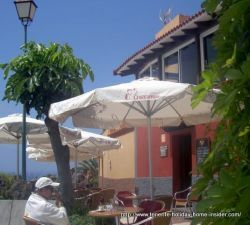 It seems to be the only garden restaurant that's not part of a hotel in Puerto de la Cruz. Below one of the stairs that lead down to Puerto from Alberto's bar is the building that's depicted. Terrace Cafe and Arte equestre Andaluz is written on the entrance. The latter means Art of Andalusian riding. However, its telephone number 922 385 540 doesn't help to solve its puzzle. Other attractions of Taoro Park. The historic Tenerife Anglican church of Taoro which has a good choir and famous flea market sales with happy merry go rounds right through winter. The British Yeoward school (Tel: + 34 922 384 685) near Carretera Las Arenas. The British library another icon of Tenerife history of the North. A small Orchid garden next to it. Click the photo to learn more about the Lido of Puerto de la Cruz which now houses the Casino of Parque Taoro. It takes about 20minutes to walk up the steep hill to the Park of Taoro via the waterfall stairs. A rental car is definitely a good alternative. Anglican and Catholic Church of Taoro Park. While the municipal Rastro flea market 'Mercadillo' in Puerto de la Cruz is free for sellers, the churches are charging about EU 10/table at the Taoro. Risco Bello Park at Taoro. There is a tropical Tea garden to the left of the former Casino Taoro. 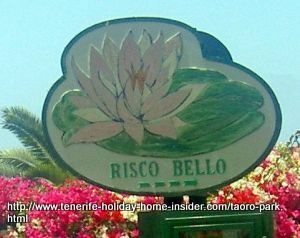 This idyllic garden has more lakes and is called Risco belo aquapark where where visiting the pond area costs a small fee. 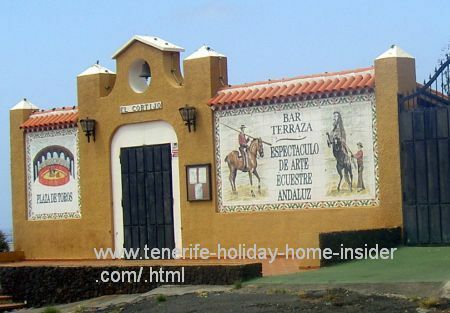 Tenerife Guanche History of Taoro. Mural with common scene of elite Guanche life. 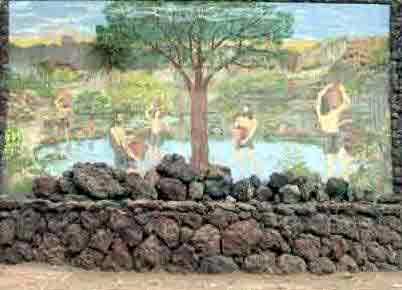 The mural depicts royals of King Bencomo of the Guanches which all had long hair, contrary to normal folk. The scene happened before the Adelantado de Lugo disturbed the Guanche peace in 1498. Indeed at that time, one or more waterfalls fed a small lake for the delight of royal Guanche folk in this Taoro spot long ago. Below, enjoy another view of today's main waterfall called Cascada del Parque Taoro by the Spanish. The kingdom of Taoro whose Guanche name was never lost stretched from the Guanche Icaude region of today's Icod de los Vinos as far as El Sauzal/Tacoronte. 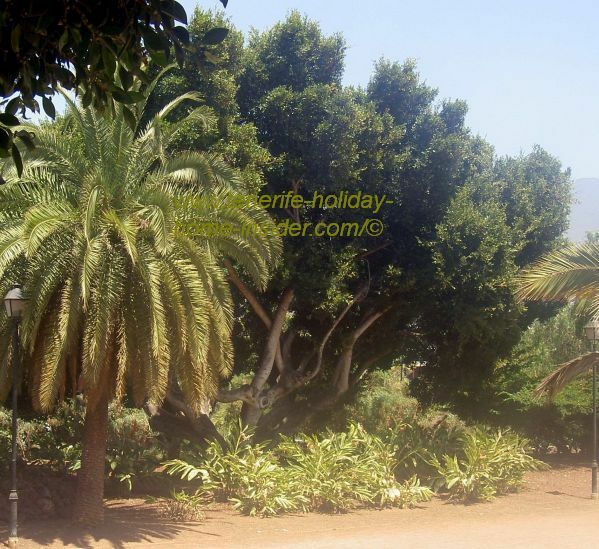 More about the Guanche who didn't only dwell at Taoro Park but all over Tenerife here. Also, encounter wall tiles outside the fountains of the Taoro Mirador. They all show symbols and drawings about Guanche living and its culture. Gorge Barranco Tafuriaste for new Taoro access? This has been in the pipelines only and was reported by the media more than once. It would help to have a bridge that connects the Taoro suburb with neigboring La Paz. Conclusion or last word about Taoro. Parque Taoro, as the Spaniards say, is certainly not the most practical suburb for getting up and down Puerto Cruz hills or for people who favor beach holidays. It's ideal for everybody with a rented car and for all who want to relax slightly off the beaten track. 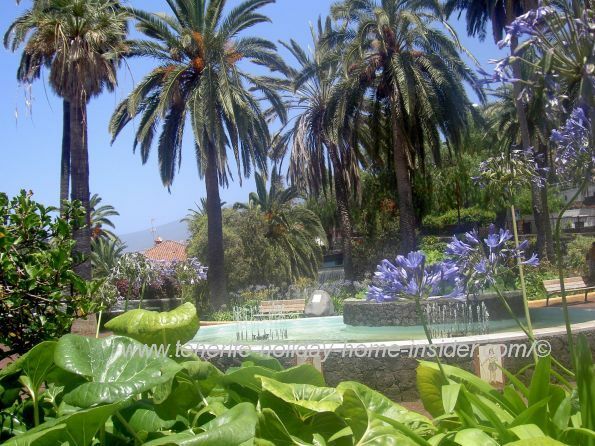 In this context, Taoro Park is a perfect location for a healthy life style outdoors in a garden suburb as well as for Tenerife property investments in elite surroundings. How get to Taoro Park from the coast? 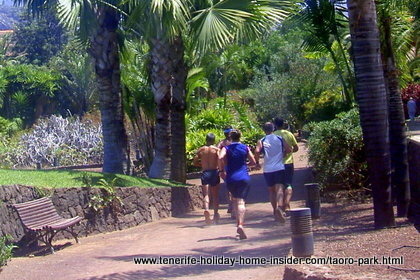 Find directions to walk or drive to Taoro Park from the Puerto de la Cruz tourist hub, here. By the way, note that more and more unemployed local youth seem to hang out by the Taoro Waterfalls since Recession 2009, just in case that this makes you uncomfortable. Generally, local youth are good kids. But take care... Simply never take valuables along when strolling through any parks, anywhere in the world. 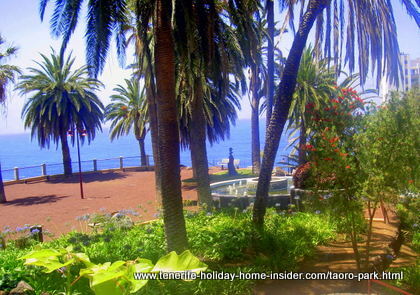 From Taoro Park back to Puerto de la Cruz which includes a link for much exciting shopping within and near its town. Would like to go back to Top of Page?